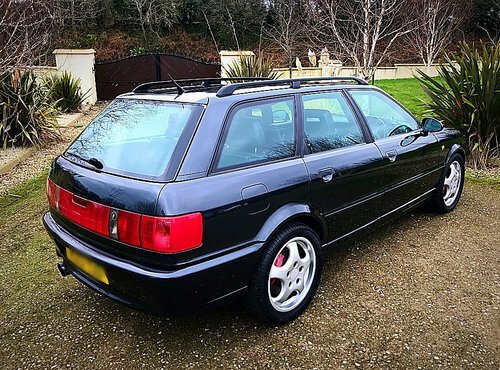 ABOUT: The Audi RS2 Avant , usually known as Audi 80 RS2, was a limited edition, high-performance Audi five-door, five-seat estate car (station wagon), manufactured from March 1994 to July 1995. Collaboratively designed as a joint venture between Audi AG and Porsche and built on Audi's 80 Avant, It was Audi's first "RS" vehicle, and the first of their high-performance Avants (Audi's name for an estate car or station wagon); it used the most powerful and most thoroughly developed version of Audi's inline-five cylinder turbocharged internal combustion engine. Based on Audi's 80 Avant, and built on the Audi B4 platform. It was powered by a modified version of their 2.2 litre inline five-cylinder 20-valve turbocharged petrol engine. This internal combustion engine produced a motive power output of 232 kilowatts (315 PS; 311 bhp) at 6,500 revolutions per minute (rpm). 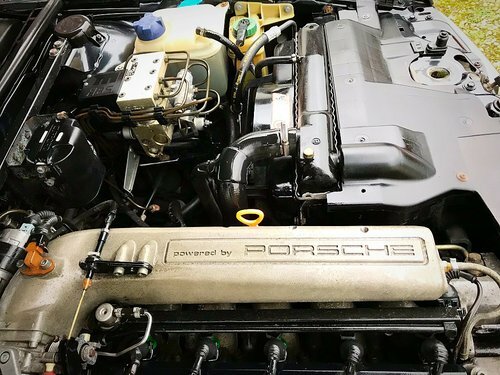 Although much of the car's underpinnings were manufactured by Audi, assembly was handled by Porsche at their Rossle-Bau plant in Zuffenhausen, Germany, which had become available after discontinuation of the Mercedes-Benz 500E, which Porsche had manufactured there under contract. The Rossle-Bau plant also produced the famous Porsche 959. A six-speed manual gearbox was the only transmission choice. Audi's Torsen-based 'trademark' quattro permanent four-wheel drive system was standard. Front and rear final drive units contained a conventional 'open' differential, although the rear also has an electro-mechanical diff lock. 40 millimetres (1.6 in) lower than a standard 80 Avant, the suspension and braking upgrades combined to give the RS2 the handling and braking capabilities of a high-end sports car; 7.0Jx17 inch Porsche 'Cup' roadwheels, and high-performance 245/40 ZR17 Dunlop tyres were standard as well. In fact, the braking system wore Porsche-badged Brembo calipers, and both the wheels and side mirrors were identical in design to those of the 964 Turbo. Additionally, the word "PORSCHE" is inscribed in the RS2 emblem affixed to the rear tailgate, front grille and steering wheel. 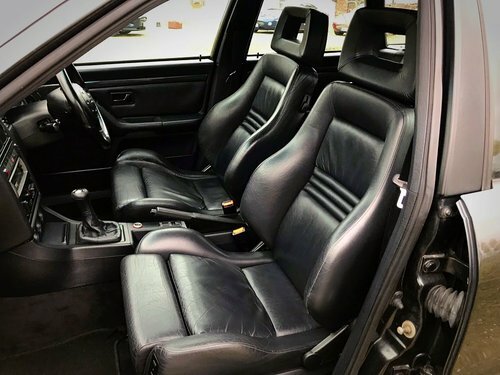 A three-spoke leather steering wheel, Recaro sports-bucket seats, and console materials in either wood or carbon fibre trim rounded out the vehicle's interior changes. Audi's proprietary Safety Restraint System, procon-ten remained from its donor vehicle. Audi's tough Quattro drivetrain, and a sprinkling of special parts, such as the Cup alloys and 968 brakes served notice that it was very much a thoroughbred product from Porsche's Zuffenhausen factory. On the road, it didn't disappoint. Acceleration was vivid, and now legendary. In its 1994 road test Autocar cracked 0-30mph in 1.5 seconds and 60 in 4.8, aided by brilliant traction - and that's still pretty fast today. Yet for those not in the know, the RS2 looked like any other top-end Audi 80 Avant. 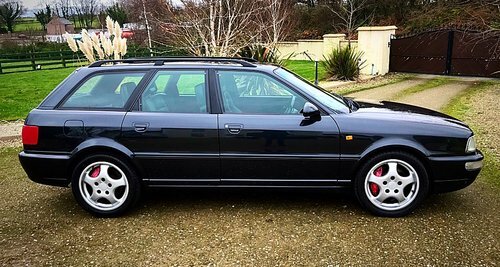 The big wheels, Porsche mirrors and red reflector panel were subtle tell-tales, but in reality, this mid-sized estate passed by most people, and was capable of giving a stealthy kicking to some pretty serious machinery. As Q-cars go, this was a good as it got back in the '90s. Back then, good ones were still around £20,000. Memories of driving one will be crystal sharp and dominated by the explosive acceleration once the turbo was spinning, hard-edged five-pot warble baying its accompaniment, and an almost maniacal desire to bang into the rev limiter thrown in for good effect. Then there was grip. Oh my goodness, the grip. Catapulting out of bends, or from hooning from toll booths, it went like a kicked cat. 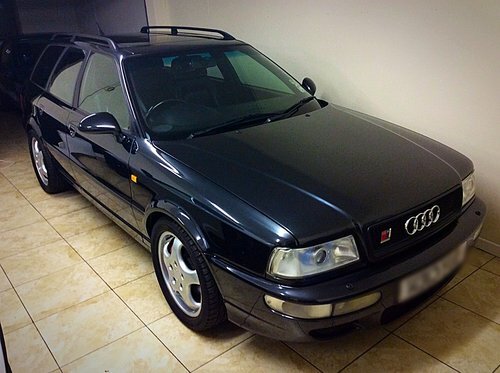 We weren't the only one's who saw the RS2's potential as the ultimate Q-car. Back in 2006, H&H Auctions had an RS2 for sale, with a curiously low estimate, looking good in Nogaro Blue - definite bidding fodder. But the car had a story. It had originally been stolen from an Audi dealership before being converted into the ultimate getaway car by a gang of bank robbers. 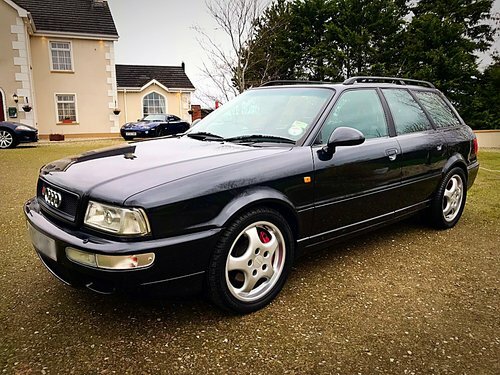 They disguised it as an 80 TDI Avant by changing its chassis plate, interior, bumpers, tailgate, and wheels - including the fitment of plastic wheel trims. The real shame is that the seller put it back to standard, and what's not recorded is whether the criminals got away or not. But it's a good bet the car would have had little trouble outpacing plod's Vauxhall Omegas. 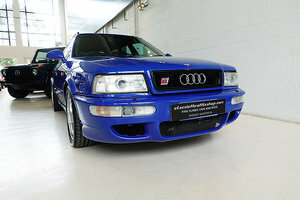 Priced at £45,705 even 20 years ago, it was by no means inexpensive. 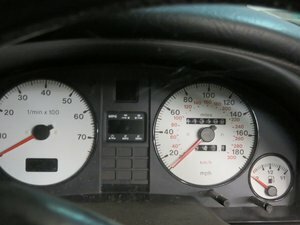 315bhp at 6500rpm and 302lb ft of torque at 3000rpm, which enabled the RS2 Avant to sprint from 0-62mph in 5.4sec while romping to its 163mph top speed. By today’s standards, these performance numbers would keep a Porsche Cayman S with PDK incredibly honest. We found the Audi RS2 Avant impossible not to like. Over time it has cemented itself as a Quattro GmbH legend. 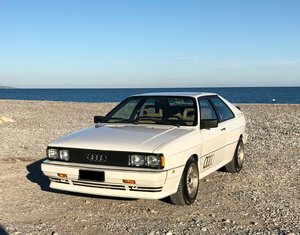 The vehicle is presented with a meticulous history and excellent provenence, the vehicle has been enthusiast owned and fully maintained regardless of cost with frequent visits to Audi dealerships for scheduled maintenance. The vehicle was registered with its first owner on 17/10/1994 until 05/02/1999, then the second owner from 05/02/1999 until 14/02/2002 and its current owner from 14/02/2002 until current. 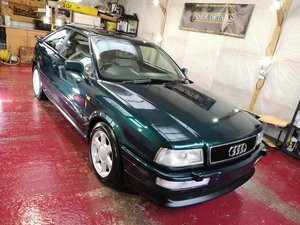 The vehicle is supplied with current V5 registartion certificate(old style v5's also included), all previous MOT's, service invoices, HPI certificate, Clifford concept G500 alarm and immobiliser with insurance certificate and spare fobs, original Audi RS2 sales/marketing brochure, original 1992 Audi Sports brochure, Various RS2 articles and memorobelia. Vehicle will again be fully serviced before reaching its new home. The vehicle has had a Sach's performance clutch kit installed within its history and also other scheduled maintenance work such as mounts, joints, tie ends, track ends and discs & pads etc. The timing belt and water pump were last changed on 13/05/2004 at 108270 miles at AH AUTOMOTIVE. The vehicle is presented in an immaculate condition with an amazing body/paintwork free of any blemishes or marks. The interior is presented in superb condition free from any markings/scratches on the leather. The seat bolsters show very minimal wear and all features are operating without any issues. The wheels benefit from a recent refurbishment and do not have mark on them and also wrapped in a set of new tyres recently. An amazing vehicle, an opportunity to own not just a car, but a piece of engineering history.